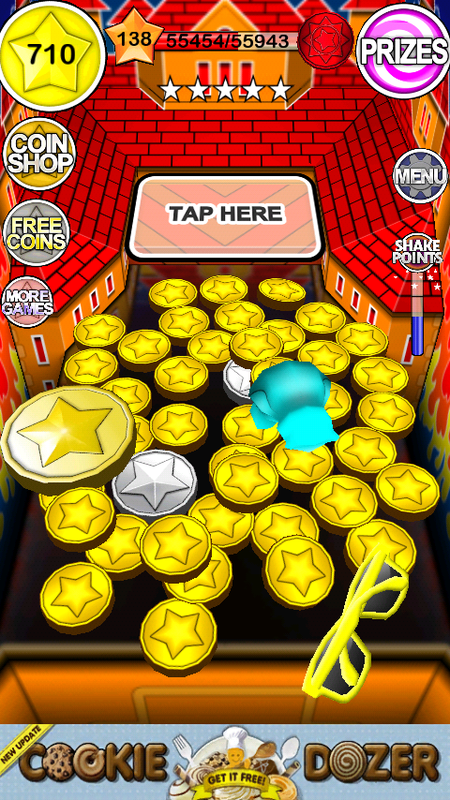 COIN DOZER , the name might not sound familiar, but the game might be. It's an arcade game. I don't know if they are still around since I don't go to arcades as much as I used to. The real name of these types of machines escape my mind. I do remember being next to one while kids bang the machine a little to see if a coin would drop off, earning them another turn or a prize. The one's I've seen in real life also sometimes had a pivot where you can aim the direction of where your coin would go or land. It might not really give you control but it gives you a sense of control and let you have more input and interaction. The developers at Game Circus have brought you a FREE smartphone port of the classic arcade game. Here's the cool part. Unlike real machines where you lose a coin, most likely a token worth a quarter, you basically have unlimited amounts of tokens and you don't lose any. That statement is partially true because at lower levels, and for a long time after that, you will have a low regeneration limit. You generate a coin about every 35 seconds while on the app. While you aren't accessing the app, the regeneration rate is a lot slower like 1 coin per 6 mins. A timer telling you how much longer until your next coin will be shown inside the yellow circle next to the big number displaying your current amount of coins in the top left hand corner of the scree. Another reason why the said statement is partially false is because while the app is loaded, it will drain your battery quite quickly. This is possibly due to the app being required to simulate a moving machine with all the coins' interaction with each other. Also unlike real machines, your taps on where to drop your coins are quite accurate. You drop them left or right, you also get to choose a bit of depth on where to drop your game piece. Another unrealistic aspect of the game that contributes to its funability is its different power ups. As you progress through the game and collect prizes, you'll notice that it becomes easier and easier to gain coins and experience had longer sessions of gameplay until you ran out of coins and had to regenerate. After you collect a set of prizes, one of each color of that item, you gain a certain power up. Here is a list of the prizes and their respective powerup. Descriptions are taken right out of the game. Bears - Coins regenerate faster. Higher tiers give even faster regeneration. Puppies - New Coins will sometimes change to Silver Coins. Higher tiers increase the chance. Fish - Sometimes a new prize will appear whenever you collect a Giant Coin. Higher tiers increase the chance. Sunglasses - Special Coins and Prizes give more XP. Higher tiers will give even more XP. e the Coins even more. Cars - More new Coins will appear after a Giant Coin drops. Higher tiers give even more chance. Dice - Coin Walls stay up longer. Higher tiers make Coin Walls stay up even longer. Gems - Get extra Coins whenever a Special Coin drops. Higher tiers give even more coins. Hearts - Special Coins and Prizes appear more often. Higher tiers make them appear even more often. 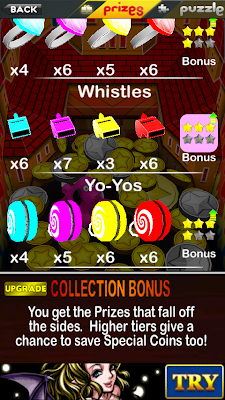 Whistles - You get the Prizes that fall off the sides. Higher tiers give a chance to save Special Coins too! In my opinion this is the most important power up...the game knows this and makes it the rarest prize of all. Once you gain this power, if other prizes fall off the side, you don't lose that prize. I know that is just repeating, but it's really important. (not sure what you can do about it though as you should be trying to get all prizes) You'll see what I mean when you get this power. 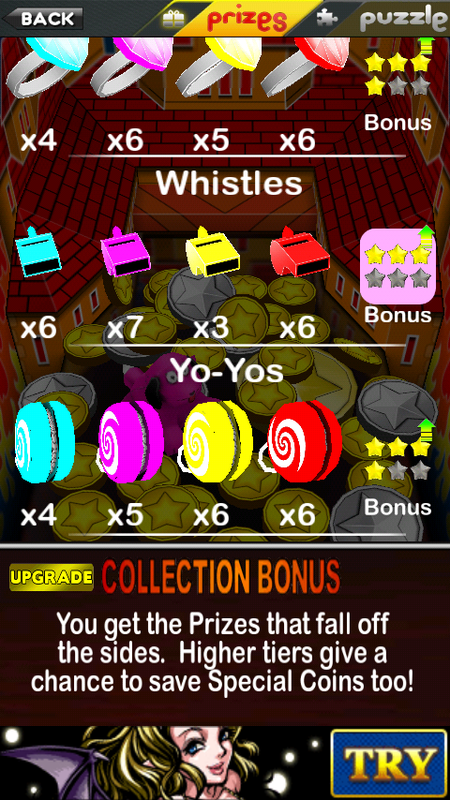 Yo-Yos - Increase Coin regeneration Limit. Higher tiers increase the limit even more. Trivia: the prizes in the prize menu rotate at least 180 degrees using the accelerometer. It seems the default positions would be with the phone laying in a flat horizontal position. There are also Special Coins. The screenshot does a good job at explaining, but I'm writing them out to increase chances of search hits for the article. Silver Coins =Are worth about 3-4 of the regular gold coins. Turquoise Coin = Walls come up on both sides where coins usually drop. 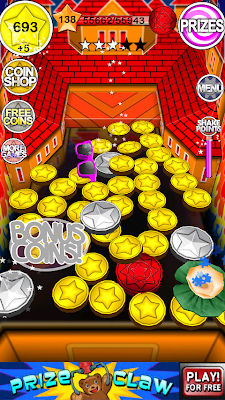 While the walls are up, coins cannot drop off the sides. 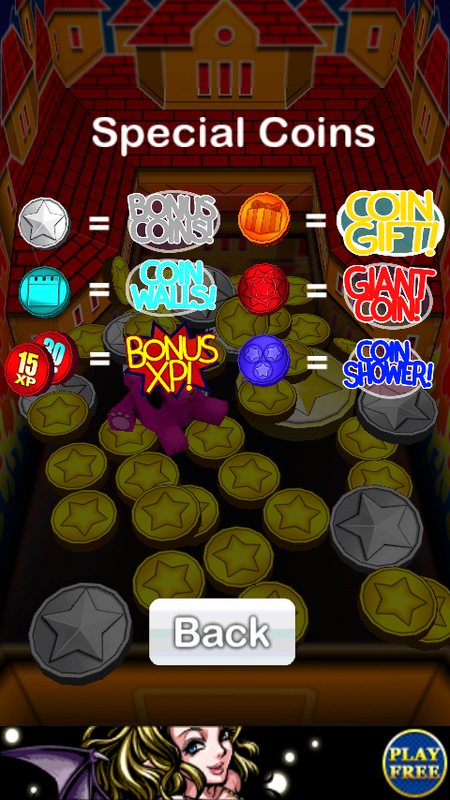 Coins with XP on them give you the respective amount of experience when you collect them. Orange Coins = a prize drops onto the play area. Red Coins = A Giant Coin drops from the sky into the play area. This shakes things up when it lands. 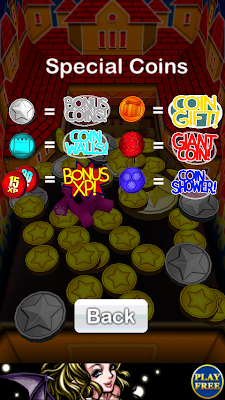 Blue Coins = Coin shower. Coins will drop into the play area. Your accomplishments truly effect your gameplay. At about level 120 you become invincible and really have unlimited coins due to increased regeneration rates of coins, special coins, and prizes. At this level my maximum regeneration limit had not gotten to it's highest tier, but it was so easy to gain coins through gameplay that this limit was no longer significant. My personal addiction level: I can't remember exactly and have move onto other addictions upon completion, but it was at least a week. The addiction was so bad that I even adjusted my phone's screen timeout(delay before the screen automatically turns off) wait to it's maximum 30 minutes and left the phone plugged into the wall charger with the screen on. I had never done such a thing to my phone. Like almost all apps, the addiction wore of after a while, especially since I defeated it. Although it felt a little sad at the end, the game gave a sense of accomplishment which is uniquely rare among smartphone apps. Those accomplishments (power ups) were not easy to obtain. There are side missions such as collecting puzzle pieces. One you have collected all the puzzle pieces for that puzzle, you move on to the next puzzle. You can also collect fair prizes that have something to do with a Game Circus menu. Sometimes you earn a DP for collection sets. However I do not know what to do with these points. There isn't an real strategies that I can think of. I like to line up my coins in a row (horizontally) to act as a push instead of one coin pushing in a more random directions. The game is consistent so you have a little control(barely). The game controls the prizes that come and it does a pretty really good job at not letting you get too much of one set. This balanced formula really just leaves the gameplay to chance and choices the game makes. You just drop 1-5 coins at a time. One strategy would be to make sure you have a lot of coins before you collect a Coin Wall (Turquoise coin). That way when the walls come up, you'll be able to keep putting down the maximum number of coins as you can and use the walls before they go back down. A suggestion I have would be to make sure to sell prizes that you won't be needing for a while. For example if you have 5 red yo-yo's and only have 1 yellow yo-yo, the chances are you won't be needing at least 2 red yo-yo's for a long time. You may even get more red yo-yo's before getting a yellow yo-yo. In this situation I would sell 2 red yo-yo's for coins. Of course if I kept checking my prizes and selling the extra's I wouldn't have 3 extra yo-yo's of a specific color. I mainly did this when I wanted to prolong my gameplay like in a gaming mood. There are many various versions of these although this one appeals the most to me(and I don't want to start over). 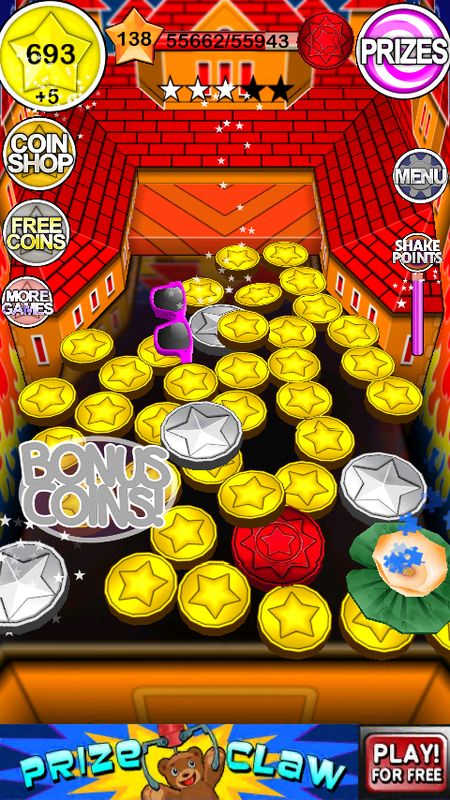 For example, Coin Dozer Seasons, Coin Dozer Halloween, Cookie Dozer. Enjoy, and don't overdo it.